of the country in his heart. I am somewhere to the left of Bernie Sanders politically. Today is not the day for politics. Leave that to history. What I can and do admire about George HW Bush was his abiding sense of service. For a guy of those means to put off college and then become a wartime aviator.... wow. And all his subsequent service. Let me ask you, do you want the world picking over your faults the day you die? Didn't think so. As I said, I never voted for the man. But today isn't that day. Stay classy. Leave the criticism and analysis for another day and while you are at it, find the Twitter feed of presidential historian Michael Beschloss. 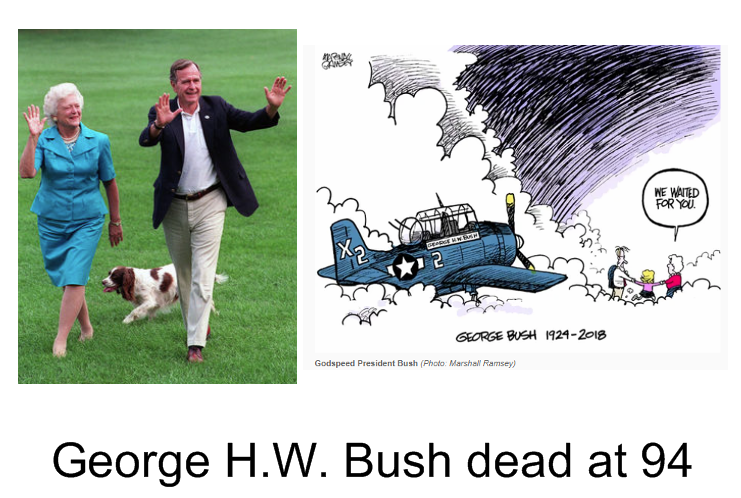 He posted some wonderful photos today in memory of President Bush. Some make me pine for a simpler, more hopeful time. Plus, he and Barbara were married 73 years. 73 YEARS! Heck, today some folks can't manage staying married 73 days. Politics aside,our nation could use a few more like him. Great comment - Thanks Janet.